TV is one medium of entertainment that is still used millions of people to date, along with the development of technology of gadgets and internet, TV evolved into a smart TV. Smart TV is a TV with installed operating system (mostly WebOS and Android) so it can be used more than just watching conventional TV channels. In addition, many brands are turning to LED technology for their TV displays and trying to be the best smart LED TV on the market. If you’re choosing Smart TV models for your family, then check out our reviews about the best Smart LED TV you can buy in 2018. Enjoy it! Check our recommendations for the best washing machines and rice cookers! Sony XBR55X800E can be considered as one of the most affordable 4K TVs. The main feature of this 4K Smart TV is the vivid colors that make you feel immersed while watching your favorite movies. The images are sharp, sharpened, and refined in real time, so you can see every detail of the building and trees you see in the picture. This TV is also slim, and it is edged in a narrow aluminum frame so it will look beautiful and fit the tightest spot of your living room. 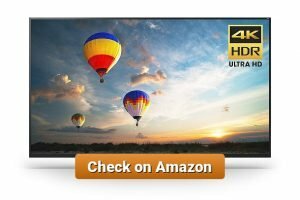 Could it be the best 4K smart TV 2018? Sony XBR55X800E features smart functionality with Sony’s Android TV that gives you access to your favorite apps. It also features a Wi-Fi and Bluetooth connection, and the internet connection can be established through the integrated wireless module or the Ethernet port. The brilliant picture quality of Sony XBR55X800E comes from the 4K resolution and the High Dynamic Range or HDR. The features provide colorful images and they are great for gaming or watching movies with colorful content. The image details are exceptional and lifelike. The great picture quality is also produced with the help of the edge-lit LED with the sleek, slim design. Sony XBR55X800E is equipped with Android OS. The OS has always been the strongest part of Sony TVs. It has more features than other OS, and with its Google Play feature, you can download many useful apps. The TV is also equipped with Opera browser which is light and perfect for TV implementation. Sony XBR55X800E features two built-in speakers, and each speaker has 10W power. The Audio Clear+ technology produces the sound that is clearer than water, but, of course, that depends on the content quality. The design is very sleek because Sony XBR55X800E has a narrow frame, and this kind of frame is a very desirable design nowadays. Sony XBR55X800E is perfect for watching HDR content. It is equipped with Android OS, a really strong feature of Sony’s TVs. The sound is loud and clear. It has a good design due to the narrow frame and the hidden cables. 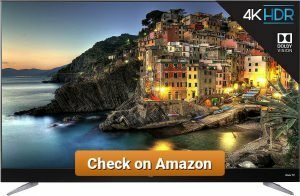 It is relatively affordable for a 4K TV. The TV setup is easy and simple as reported by most customers, while the interface is smooth and user-friendly. The TV is not equipped with local dimming, so it results in the movie watching experience. Despite the fact that Sony XBR55X800E can deliver vivid color beautifully, it does need some improvement in the contrast and black color. Even though the sound quality is already good, some customers attach their sound bar to improve it. Sony XBR55X800E is perfect for those who look for an affordable 4K smart TV with decent features to watch movies and good sound quality. TCL is the US’s fastest growing TV brand name and also one of the biggest TV manufacturers in the world. The company brings the latest series in 4K technology. TCL 55C807 is among the best 4K smart TV 2018 which has the feature of Dolby Vision HDR which enables you to select more than 4,000 streaming networks that include hundreds of thousand movies. This is a perfect choice for a genuinely high-end TV-watching experience. The slim profile features a thin metal frame around the screen. The speaker bar that will improve the audio quality is at the bottom, and it adds the sleek look to the TV. The rich design steals the highlight, and it creates a TV that looks charming both when it is on and off. TCL gives 360-degree attention to detail from the stunning front to the beautifully finished back and a beautiful stand. The powerful performance of the picture is gained by combining the premium HDR experience, Dolby Vision, with a lot of advanced technologies offering a more superior contrast and brightness of a more accurate colors. This TV also features TCL’s NBP Photon technology that can achieve color space coverage, closer to the human vision limitations. TCL 55C807, like many TCL TVs, is powered by an excellent smart TV system from Roku. The smart TV system is fairly easier to use than other systems. It has more apps and more frequent updates to maintain the quality. The system already works well, so you do not need an additional box or stick to stream Netflix, Amazon, and many other webs. It also makes the 4K and HDR/Dolby Vision streaming apps of this TV the best of its class. For more convenient streaming, you can use your tablet or smartphone as your streaming companion. You can use it as a remote, or to share your music, videos, and photos to your television. You can also plug in your headphones to listen to the sound privately. In addition, you can also cast movies to your TV using YouTube and Netflix mobile apps. The TV is also accompanied by an advanced remote that is super simple with easy navigation, voice search function, and headphone jack. TLC 55C807 is very easy to use, so you do not need to wade through complicated menus. Choosing your favorites apps and movies is as easy as tapping an icon on your smartphone. You can choose from more than 4,000 channels with over 400,000 movies and TV series episodes. Prices are a bit higher than other TVs in its class. It doesn’t provide a feature for refresh rate smoothing. The bottom bezel doesn’t actually provide improved sound. TLC 55C807 is perfect for you if you are looking for a larger screen with fantastic value. 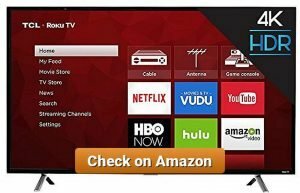 Even though the prices are a bit higher, it is still a strong choice and can be considered a budget smart TV. This TV is also perfect for those of you who like to stream TV series or movies. TCL is a company known as one of the largest TV manufacturers and the fastest growing TV brand names in the US. The company brings the latest series in 4K technology, and their product, TCL 55C807, is among the best 4K smart TV 2018. The 49-inch 4K TV produces an excellent picture and is equipped with Roku TV at a very reasonable price. This TV belongs to the TLC’s S-Series that supports high dynamic range (HDR) technology. To find out more about this TV, keep in reading this article. The TCL 49S405 series is one of the least expensive 4K TVs on the market, but it does not mean the quality of this smart TV cannot compete with other TVs. Below is the list of the features that you can get when you buy TCL 49S405. The 49-inch set has the same sleek design as other models in TCL’s S-Series. The screen is framed by a slightly curved, glossy black plastic bezel and a matte-black cabinet for all of the TV’s internals. When you buy a TV, picture quality should be your main concern. This TV ticks all the boxes in providing premium picture quality. The powerful performance of the picture is gained by combining the premium HDR experience and the striking 4K UHD. The technology offers exceptional picture clarity and detail. The Direct-lit LED feature also produces great picture quality. Like many TCL TVs, TCL 49S405 is powered by an excellent Roku smart TV system. Compared to the other smart TV systems, Roku is fairly easier to use. It has more apps and more frequent updates to maintain the quality. The system already works well, so you do not need an additional box or stick to stream Netflix, Amazon, and many other webs. You can use tablet or smartphone as your companion for more convenient streaming. Your gadgets can be used as a remote, or a medium to share your your music, videos, and photos to your television. You can also cast movies to your TV using YouTube and Netflix mobile apps. In addition, you can also plug in your headphones to listen to the sound privately. The TV is also equipped with a simple remote that only has 20 buttons to for easy navigation. Choosing your favorites apps and movies is very easy since all your favorites are at your fingertips with this TV. The interface is very simple and intuitive. You can choose from more than 4,000 channels with over 400,000 movies and TV series episodes. The TV features Roku TV which delivers a simple and comprehensive smart TV experience. It produces decent 4K picture quality with basic HDR support. The audio quality is better than expected if judged by the price tag. The lag time is short. 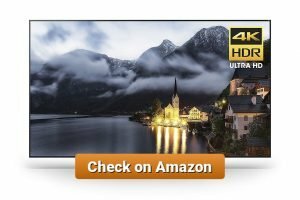 It is a great choice for 4K TV under $500. The HDMI and USB ports are not enough. It produces an unwanted shadow on the backlighting. The Roku TV remote needs enhanced features. The edges of the TV lack any decoration, so the design seems plain. 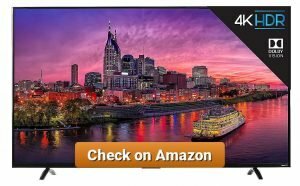 TCL 49S405 is a perfectly good budget television option for those of you who want an affordable 4K TV with decent performance. With the Roku TV feature, this TV is also perfect for those of you who like to stream TV series or movies. If you want to upgrade your TV from HDTV to a more superior 4K model with great picture detail, Samsung UN55MU6300 is a perfect reason to get off the fence. This 55-inch TV features a super sharp 4K quality picture that has four times the detail of the best HD sets. Also, with HDR or high dynamic range support, the colors and contrast are more enhanced on the HDR-encoded contents. With the advanced, state of the art, technology, Samsung UN55MU6300 is one of Samsung’s best 4K smart TV 2018. Samsung UN55MU6300 is a 4K Ultra HD TV that redefines your movie-watching experience by producing a colorful picture with HDR support. As a smart TV, it also features catchy user interface or UI and OneRemote function with the capability of voice navigation. This smart TV can provide faster access to your favorite content. The TV produces both vibrant and pure colors which can give you a realistic and immersive experience when watching TV. It can also perfectly distinguish the light to dark transition. Samsung UN55MU6300 features a speedy quad-core processor that gives you the opportunity to multitasking. You can browse the web while watching a movie at the same time. You can switch between apps and stream content whether your connection is wired or wireless. The sophisticated processor is much faster than the previous smart TVs, and Samsung’s collection of music and video streaming apps is second to none. Samsung’s smart TV operation is quite fast and efficient. Samsung completely hits the mark when it comes to their UI and intuitive navigation. In this TV, you can easily discover your most-loved movies and TV shows, music, sports, and games with Samsung Smart Hub, and it is all connected. Different members of the family are able to have different recommendation settings which is a big plus for a family or a home with multiple users. With Dolby Digital Plus, you can enjoy the ultimate sound quality when you watch your movies and stream content. The technology can optimize your experience by enhancing the sound richness and clarity so you will feel as if you are inside the movie. The slim and sleek design gives an interesting and modern appearance to the TV with a thin screen and Samsung’s iconic V-shaped center stand. The overall picture quality is in line with the price point. It gives a great contrast ratio and color. It provides great light flow due to the LED edge lights. The Smart Hub includes a web browser. The design is minimalist and sleek. The on-screen menu system is easy to operate. When the Automotion is turned off, shaking or judder can be apparent, especially with content in lower resolutions. Regarding the Side Angle Viewing feature, there is a degradation regarding contrast and color saturation. It has a noticeable screen glare. It only provides a small selection of preset picture modes. It only provides a very limited HDR capability. Samsung UN55MU6300 is a perfect choice for those of you who are looking for a decent TV watching experience. With a great Smart Hub functionality, the 4K TV is suitable for families or a home with multiple TV users. OLED, short for an organic light-emitting diode, TVs are not a very surprising technology because it has been around quite long. However, it is still as impressive. LG offers the best quality of OLED TVs, and for 2017, LG prepares a lot of selections of the screen for the customers to choose from. Even though LG Electronics OLED65C7P does not come in cheap, the quality of the TV justifies the cost. The picture quality presents perfect black levels, good contrast, and impressively wide color range. LG Electronics OLED65C7P takes the concept of minimalist TV design to a whole new level. The screen is framed only by a really thin (0.3 inch) black border and completely bezel-free. It also has a very think rounded edge that slightly sticks up against the panel. Since the design gives a lot of space for the screen, the TV does not even have an LG logo. The logo is placed on the metal table stand. The TV features smart functionality using webOS 3.5 that gives you an opportunity to access your most-loved apps and contents. The webOS menu system is more mature and snappier than the previous 2017 TV models. The motion-based remote is very sophisticated and helpful when you sign into your apps using the on-screen keyboard. LG Electronics OLED65C7P pairs the technology of 4K Ultra HD that provides picture clarity like no other with the perfect contrast, color, and detail of the high dynamic range (HDR) technology to present the most life-like TV experience. The OLED pixels are individually lit, and it can achieve the ultimate contrast and the perfect black for impressive picture quality. Some other picture-related features are Cinematic Color, Billion Rich Colors, Ultra Luminance, and Pixel Level Dimming. LG Electronics OLED65C7P is the ultimate representation of cinema-quality experience in the comfort of your home. All content that you watch achieve the peak of picture quality due to the Active HDR feature and Dolby Vision. The TV also features Dolby Atmos audio which is just as impressive as the most sophisticated movie theaters. With the state-of-the-art, theater-like audio quality, Dolby Atmos is able to create a sound that seems to appear from anywhere. Your movie-watching experience becomes incredibly realistic and immersive. The detail presented by the TV is mesmerizing. The super-rich colors are a pleasure to the eyes, and they give an ultimate movie-watching experience like no other. In some TVs, sometimes, when we watch a scene in the dark, we do not feel comfortable because the picture quality will degrade. But with this OLED TV, the black color is represented perfectly, and it gives limitless contrast. One of the best features of this TV is that you can watch the TV from any side with no problem. The smart OS embedded in the TV will give you the opportunity to access your apps perfectly. It also features some major sites like Netflix and Amazon. Some people claim picture artifacts are visible. There are some video noises during scenes in the dark when watching a movie from Blue Ray or DVD. 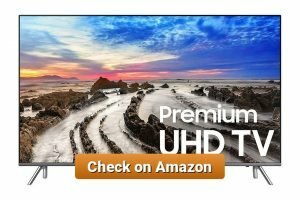 This TV is perfect for you who are in search of the best smart TV 2018. If you want to have a minimalist TV with great functionality and life-like picture, this is one of the best options for you. The era of smart 4K TV is here. However, not everyone can spend a grand or more on a television, especially if such television is using the manufacturer’s proprietary operating system and dropped like hot cakes after one or two patches, or if you need another box to access your favorite streaming service. Thus, before buying a TV, it is important to consider the software powering it, as well as its picture quality and ease of use. Finding it hard to find a TV that checks all the box? TCL P Series is a sub-$1000 TV that you should consider. Powered by Roku, it supports a lot of streaming services with an easy to use user interface. Its picture quality is also top-notch, so it would not be a stretch if we crowned it the best 4K Smart LED TV 2018. All 4K televisions need upscaler in order to display lower-resolution content in 4K. However, the upscaler engine could cause display lag and loss of image quality. However, it is not the case with TCL P-series. The 4K Creative Pro engine built onto this TV will ensure that your content will pop from the screen, and it even manages to minimize display lag. Yes, you read it right. This TV is powered by Roku. It means that you can access your favorite streaming services out of the box. Updates are also guaranteed, and that will sweeten the deal even more. HDR contents are all the rage today. There are two leading standards of HDR, which are HDR10 and Dolby. Usually, a device which supports HDR10 will not support Dolby’s HDR feature, and vice versa. However, this TCL TV can display both types of HDR content flawlessly. It is hard to find a decent 4K TV under $1000, much less a full-featured one. So, the TCL P series will exactly fit the bill. A lot of streaming services support Roku, so you will be able to easily access them without the need to buy any streaming boxes or roll your own home theater PC. Just choose your preferred streaming service in the Roku store, and you’re all set. Some of the high-profile streaming services you can find in Roku store are Netflix, Spotify, and BBC. TCL’s panel can easily display deep black levels, almost as if the panel is an OLED. It also offers rich image contrast and accurate colors. Also, even with the 4K upscaler, it can maintain a very solid display lag amount, almost as if it’s lagless. If you play rhythm games or any other games requiring timing precision, this TV is for you. Initially, TCL planned to release larger P-series, even up to 75 inches. However, their plan got scrapped, and as it stands currently, the TV is only available in 55-inch. It is not really a dealbreaker, however; 55 inch is a sweet spot between size and image quality. This TV is suited for budget-conscious users seeking an easy to use TV. It can also be used as a gaming monitor, owing largely to its minimal lag when used as a monitor and its flawless 4K upscaler. 4K TV is one latest innovation on the electronic market. Considered as one of the best Smart TV 2018, 4K TV offers four times as many pixels as the old HD model, offering impressive picture quality and details. If you’re looking for the best 4K Smart TV 2018, you may be interested in Samsung Electronics UN65MU8000 65-Inch 45 Ultra HD Smart LED TV. This Samsung UN65MU8000 is good for you who want the best viewing experience, especially from one of the best Smart LED TV. This feature presents a greater range of contrast with peak brightness and black levels, to present better picture details and vibrant colors. It is used for extended brightness and contrast when HDR content is viewed through connected sources or streamed from the apps. This shows billion more shades than regular 4K UHD. You may watch streamed 4K video sources such as Netflix, Amazon Instant Video, and YouTube. This TV offers a unique feature set that makes Netflix easier to use and enjoy. Samsung’s set of streaming video and music apps are available. These apps will let you receive live notifications from UN65MU800 and help you locate the content. It is a separate pod that receives HDMI and audio cables for connecting to the TV. Since it is separated from TV, this pod can be put in a cabinet near the TV. This gives a very clean appearance for the whole installation. The latest Samsung’s One Remote (TM1750A) could detect and control all connected devices automatically. This remote also supports voice control. The UN65MU8000’s build quality is nice and considered beautifully designed. Therefore, the attractive design fits well with most room decor. It also considers a neat look, by providing cable management capability through the base of the TV stand for unseen and clean cable routing. Shadow detail on this TV is very good, revealing proper amounts of shadow detail and depth among objects within dark or dimly lit scenes. Motion handling is considered really good when viewing content consisted of sports events or movies with fast paced actions. Besides its strength, this TV also has some minor flaws. Firstly, it’s related to the side angle viewing. This model has some fairly weak viewing angles so that people sitting at an angle to the TV will not have as good picture quality as people viewing from in front. Secondly, the sound reproduction is considered poor and needs added speakers. For all of you who want to get the best view from a large TV of 65 inches, it is time to settle on this Samsung TV. This TV delivers good and realistic picture quality, with plenty of clarity and image depth with all HD content. With its One Connect feature, this TV is suitable for people who want to easily connect cords so that they don’t need to move the TV when connecting new devices. Samsung Electronics UN65MU8000 successfully demonstrates why TV experts are so excited about 4K and HDR. High peak brightness is the essential feature of this TV which makes it one of the top Smart LED TV 2018. Other smart features of this TV which are easy to use also project how this TV becomes the best 4K Smart LED TV 2018. Nowadays, 4K TVs are quickly replacing HDTVs. It is proven that you will get much better picture quality with 4K resolution (sometimes called Ultra HD) than the older 1080p HD format. At this point, are you looking for the best Smart TV 2018? 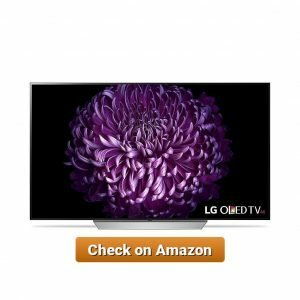 If you are interested to find the best 4K Smart TV 2018, look no further than LG Electronics OLED55B7A 55-Inch 4K Ultra HD Smart OLED TV. 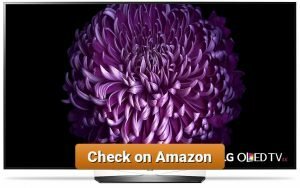 This LG Electronics OLED55B7A is one of the most advanced sets on the market, and without doubt, the best 4K Smart LED TV 2018. LG OLED pixels could capture the night skies as dark as night skies themselves. OLED pixels could create their own light, to have perfect black levels. This feature may show you super deep black and brilliant colors. This LG OLED TV offers an ultimate expression of High Dynamic Range. Unlike some other 4K TVs, this series supports Dolby Vision as well as the new backward-compatible HLG HDR standard. With Dolby Vision available, this TV optimizes the picture scene-by-scene, with smooth color, beautiful textures, and fine details. LG has its webOS connected platform. This Smart Functionality gives you access to your favorite online content and apps through webOS 3. With a mid-range price, you get this 4K Ultra HD picture clarity with contrast, color, and detail of HDR pictures. You get high brightness by OLED pixels which achieve ultimate contrast for outstanding picture quality. As a result, this TV presents a great viewing angle, better than most LED TVs. Thus, there is no change in the clarity and color from any angle, no matter how you look at it. Every seat in the TV room could get a clear and vibrant picture. Another upside is that this TV also has built-in Wi-Fi and Ethernet connectivity which allows you access Internet-based apps or content through LG Content Store. You could use your smartphone for media sharing on this TV. There are also four HDMI inputs for connecting high-definition video sources. There is also composite RCA input for analog sources and three USB ports for connecting multimedia peripherals. Beside its favorable aspects, this TV also has several weakness points. It tends to suffer from a slight image retention problem temporarily, which means you will notice ghost images on screens or retained image that will go away after a few seconds. This TV’s speakers are also considered pretty weak so that you may have them attached to external speakers. LG Electronics OLED55B7A is perfect for people with the large living room since it has a very good viewing angle and picture quality, which remain good no matter where you will be watching. It’s also good for you who want to enjoy viewing content at four times the resolution of 1080p, which may even upscale lower-resolution video sources to near-4K quality. You may find most lifelike pictures with the most HDR entertainment choices and provided with webOS Smart TV platform. Overall, LG Electronics OLED55B7A is considered a terrific 4K TV. It offers fantastic picture quality, dynamic HDR images, and the ability to deliver profound black depth, which makes it one of the best Smart LED TV. Not only giving clearer and sharper picture, but this TV also has many specifications which make it one of top Smart LED TV 2018. Now is the perfect time to get yourself a 4K television set. The price of a good 4K TV is not as astronomical as it was before – you can get a decent TV with great panel and feature set below $1500. However, be aware that some TVs offer proprietary operating system, so you might need to buy a separate streaming box or roll your own home theater PC to access your favorite streaming service. Cheaper 4K TVs also come with bad panels, hindering you from enjoying contents. Sony’s X900E, though, is powered by Android TV, and being a product of Sony, it is also a showcase of Sony’s imaging expertise. The TRILUMINOS panel displays great pictures, no matter what the content is. It wouldn’t be a stretch to call it the best 4K smart LED TV 2018. Amazon has confirmed that the Sony X900E supports Alexa. It even bundles the TV with Echo Dot. With Alexa, you can use voice commands to control the television. Forget fiddling with the couch to find that tiny remote, just say your command and the X900E will handle it. Alexa can be used for a lot of commands, from changing channels to switching input modes. Forget HDR, this new technology from Sony promised 5 times the clarity of normal HDR sets. It achieved the feat through full-array local boosting and dimming technique. The TV also supports HDR10, a leading HDR content standard, and can display Dolby’s HDR content without any problem. Sony is a leading company when it comes to product design, and X900E is no exception to this rule. The industrial, slim-bezel design looks great on your wall, and it even comes with separate power brick just to make it slimmer. Once again, Sony displayed its imaging prowess in X900E. The TRILUMINOS panel shows vibrant colors and deep blacks. It even supported full-array backlighting with local dimming, which can dim some parts of the LED while keeping another part bright, depending on the content being displayed. With the TRILUMINOS panel, you also don’t need to worry about ghosting and lag, as it has a fairly low display lag. Behind the large screen, the X900E is powered by Android TV. As such, it is compatible with almost every streaming service imaginable, like Netflix, Spotify, and BBC. It is also compatible with a lot of Android apps and games. Android TV is a beast. It has a lot of features other smart TVs can only dream to have. However, it comes with a cost of an awkward user interface. If you have not used other Android TV-powered television before, you might need a few moments to acquaint yourself with its remote-controlled interface. Clearly, Google needs to learn some trick from Roku, which managed to balance between power and usability. However, if you want to, you can skip the Smart TV setup and connect your own streaming box or home theater PC. This TV is suitable for moviegoers. The deep black, accurate color, superb motion handling, and XDR technology made scenes pop out from the screen. It can also be used as a companion for your PS4, and games will benefit from its low latency. Watching TV comfortably has been granted with the existence of a flat-screen TV. However, flat-screen TVs also make the pictures look unnaturally bigger and more widely-stretched. To solve this problem, there is Samsung Electronics UN55MU6500 Curved 55-Inch 4K Ultra HD Smart LED TV. Surely, it is big and wide. Samsung Electronics UN55MU6500 has a curved panel. The screen size is mostly 65 inches, and you might want to prepare your budget around USD 1000, just to be on the safe side. The prices may also vary, depending on the size of the screen and where this flat-screen, UHD TV may be sold. Samsung Electronics UN55MU6500 has no local dimming technology. It has 4x more pixels than the old, full HD TV. Because of this, you get to see an even clearer, brighter picture – thanks to the resolution that is four times bigger. Because of the 4x more pixels, the colors produced in the picture are much more vibrant and realistic. You will feel like you are looking outside your window to see real life instead of ‘just watching TV’. There is Samsung SmartHub that connects all that you want to watch. Still unable to decide? You can view your favorite movies, sports, music shows, and many more at once before you make up your mind. There is OneRemote. With this, you get to control all your connected devices without having to program them manually. 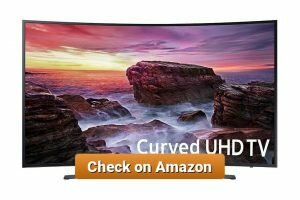 Once you have seen the Best Smart TV in 2018 here and read the descriptions, you are coming down to this part: making decisions. There are many factors to consider when you buy Samsung Electronics UN55MU6500. Want to have your own home theatre? In a dark room or moderately-lit room, you get to see that this TV with a curved panel gives you a good quality picture. With good motion handling, low input lags, and many other features, you get to watch sports, play games, and stream videos. This also works wonders to save your budget for entertainment. The peak luminance lacks the appropriate brightness, so it is best not to put this TV in a bright room or with sunny windows behind. There is a limitation to its viewing coverage angle. There is no feature to help you to remove the judder if you want to watch 24p movies from any sources. Still, Samsung Electronics UN55MU6500 is considered The Best 4K Smart LED TV in 2018. If you are into a variety of entertainment but your budget is limited, you can give this Best LED Smart TV a try. Enjoy the choices of entertainment you like at home, either alone or with your family and friends.